Things happen for a reason. Every moment and decision has meaning — even if you don’t know it at the time. As I sit in my beautiful soundproof recording studio with its Parisian decorating scheme, I still marvel at the newness of it. A little more than a year ago at this time, my house, my voice-over career and my life were severely disrupted because we were in the midst of building the addition on our house for the studio. I didn’t even make the decision to build the studio until 6 January 2005. Prior to building the studio, I had been using an unventilated, small walk-in closet as my voice-over recording booth. While I could tolerate the many discomforts of the space, it was the surrounding noise that forced me to go to drastic lengths. Even though we had decided to build a new soundproof room for my voice-over studio, I originally had no idea what the finished interior would look like. I should say I had no conscious idea, but I feel the whole project was guided by my intuition, and, perhaps, a higher power. We had planned a trip to the Salzburg Festival in Austria in August, 2001 but canceled it when my dad was seriously ill at the end of July of that year. Sometime in 2004, we had decided we would vacation in Austria for my April, 2005 birthday. 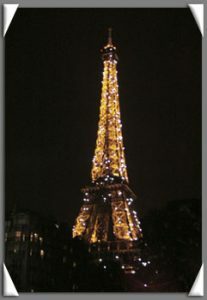 In late 2004, I suddenly and without any reason decided that I would rather go to Paris. In December, 2004, I bought tickets to see Barry Manilow for 5 concerts (!) in his new show in Las Vegas in mid-August, 2005. I was thrilled because I would have front-row and fourth-row seats. February, 2005, found us replacing all of the original single-pane, double-hung windows on the house with fantastic triple-pane casement windows. In addition to their thickness, the new windows form an amazing seal to the house and really aid in soundproofing the house from the constant melee of exterior noise that confronts us everyday. I cherish peace and quiet even when I’m not recording. I saved a few of the smaller original windows, thinking I might use them somehow as future art projects. Drew thought they were just more things to take up space in the garage. We had visited Paris for 5 hours in 2003 as part of a cruise stop, but last year, we were there for one glorious week. I loved everything about the city. On my birthday, we had the most incredible and memorable dinner of my life in the Eiffel Tower overlooking the Seine River at sunset. The Eiffel Tower is now my favorite thing in the world. 🙂 I loved to glimpse it as often as possible as we toured Paris, and I took every opportunity to watch it twinkle at night. While we were in Paris, we bought 3 paintings. I had no idea where I would put them in my house since the walls are already covered in art. I also sketched a building on the artist plaza behind Sacre Coeur in Montmartre, never intending to do anything with it. When we visited Versailles, we walked through the magnificent gardens, which are filled with ornate statues. It started to rain, so we decided to head back toward the Chateau. We passed a statue we had not seen on our entrance to the gardens, and I stopped in my tracks. I told Drew that for some reason, I felt that statue was important, and I asked him to take a picture of it. After we returned from our vacation, we selected the contractor for the studio construction. 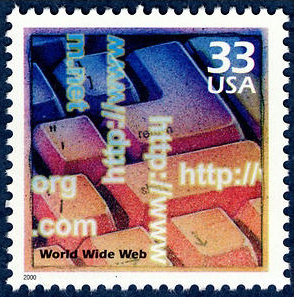 Work began in late May and dragged on until October. The details about the construction project are another story for another time! However, if you want to learn from my experience, you can download my free PDF Karen’s Crash Course in Avoiding Ca$h-Poor Contractors. I was aware of making only minimal interior decorating decisions at the outset of the project. I chose the color of the walls and carpet. I also said I wanted track lighting because I knew that I would hang some sort of artwork in the studio, given that we have art through the rest of the house. During the construction, I first decided I could hang the 3 new paintings from Paris in the studio since a new room meant 4 new bare walls. Since we built the studio without windows to improve the soundproofing of the room, I began to wonder how a faux window would look on the wall. After all, I had saved real windows from the house. I asked Drew whether my favorite picture from Paris could be enlarged to the size of the window and if it somehow could be lit from behind so that it would look realistic. Drew immediately saw the possibility of this idea and began working the implementation. Drew worked with a local Alphagraphics to enlarge the picture and mount it on Plexiglas. Drew and his dad built a box to house the lights, and Drew painted it to match the walls. Now, my studio has a window that doesn’t let in sound! 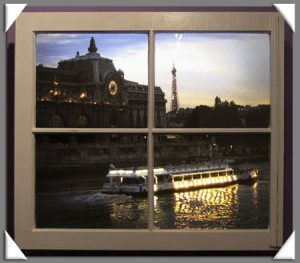 When I look out my window, my enchanting view is that of a brightly-lit tour boat motoring down the Seine at 9:10pm in front of the Museum D’Orsay, with the dazzling light show of the Eiffel Tower in progress off to the right. In June, I was given a book which showed all of the artwork of my favorite artist, Fanch Ledan. I almost fell out of my chair when I saw a print that featured the same building that I had sketched! I started to acquire several of his older, uncommon prints featuring the Eiffel Tower, and I asked a dealer to search for that one long-out-of-print piece of art. The Parisian decorating theme by this time was swirling in my brain. By August, I was so distraught over the cost, problems and delays with the studio construction that I almost cancelled my long-awaited trip to see Barry Manilow. Drew told me to go, relax and have fun; he would stay and deal with the contractor. A friend told me that I should definitely go on the trip, saying that maybe I’d find something unique for my studio. 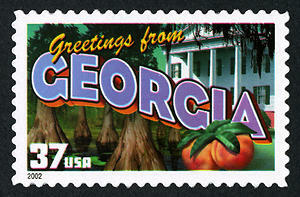 I not only had a blast at Barry’s concerts, as I would expect, but yes, I DID find something for my studio. I was staying at a hotel off the strip and had to take a shuttle to the Bellagio. Barry was playing at the Hilton, at the other end of the strip. Since the temperature was a sweltering 110 degrees (‘yes, but it’s a dry heat’, everyone always tells me when I go to Vegas, as if sticking my head in an oven would somehow make me feel terrific), I was walking outside as little as possible. After leaving the shuttle, my normal route took me through the Bellagio, across the bridge to Bally’s and through Bally’s to the sumptuous Paris Las Vegas Hotel or the Monorail. Naturally, with my fondness for Paris, I liked to hang out at the Paris hotel, which has a lobby chandeliers and mirrors to resemble Versailles. I browsed in the lovely gift shop and found the perfect wall sconces for my silk flowers. The velvety purple color is unbelievably just a shade off from the color of my walls. However, the piece de resistance came when I walked in the Shops at Bally’s. If I hadn’t walked through Bally’s every time I went anywhere in Vegas, I might not have visited their shops, and horrors! I might have missed this treasure. There, in the window of one luxury shop, was an impossibly huge, etched, crystal Eiffel Tower. It sparkled and shimmered as the light caught all of its hundreds of facets. I went in the store to admire it, but its impossibly huge price to match its overwhelming size made it seem like something I should ignore. The store owner saw my interest (can you say drooling?) and led me to the counter, where a 13′ version of the crystal Tower proudly stood. The dealer told me that I could get a rotating mirrored base that has colored lights under the mirror and was sold separately. I guess it must have been a slow day and/or the guy really liked me because I negotiated a completely wonderful deal on this mesmerizing piece of crystal and got the mirrored base for free! 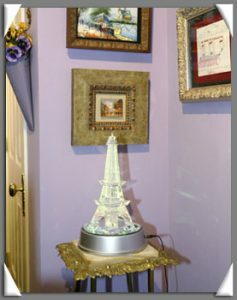 One of the Las Vegas sconces is shown in this picture on the wall to left of the crystal. Sometime in the summer, I started visualizing an overstuffed love seat with sleigh arms and carved legs. Due to the placement of the interior door, I don’t have room for full sofa. I found some love seats on-line that I liked, but they would require custom work at custom prices. One was actually in Paris, so I quickly ruled it out. One hot Saturday, Drew and I went to a half dozen nearby furniture stores. We saw nothing that looked French, carved or anything that even halfway compared to the type of love seat that I envisioned. Oh, and did I mention that I wanted a green love seat? Exhausted by a day of fruitless searching, we made one last stop into Haverty’s. We almost didn’t go there because no one else had anything, and we had no expectation that Haverty’s would be different. We should have gone there first. My dream love seat was waiting for me there. Once construction was complete last fall, I started thinking that I would like a tapestry to cover the electrical box that is behind the door that leads in from the kitchen. We were looking for the fabric to match the love seat to use as drapery fabric for the faux window. We didn’t find the fabric, but we saw some tapestries hanging on a rack. After inspection, none were suitable for my studio. On the way out of the store, though, we discovered that we could send our picture to a company which would create a custom tapestry from our picture! 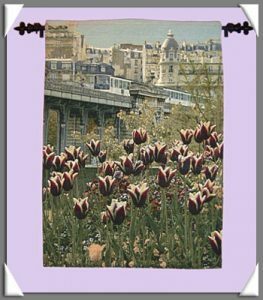 We knew immediately which picture to use: a striking shot of crimson tulips swaying in the foreground with a Parisian subway train rounding the bend front of typical blue-roofed apartment buildings in the background. Drew shot the picture while we were walking from the train station to the Eiffel Tower on the way to my birthday celebration. The company that makes the tapestry even supplied a rod with fleur-de-lis endpoints. My studio decorating theme may seem like a happy accident until I look back and realize it couldn’t have been any other way. It’s the voice-over recording studio of my dreams…and then some. If you have stayed with me this far, you may be wondering why I have told you the detailed story behind my studio decoration. So often, I think our intuition gives us amazing guidance, but we ignore it. In fact, this entire blog entry was guided by my intuition. When I started writing, I had in mind another lesson that I wished to relate. However, my fingers typed this one, as if taking dictation. Perhaps someone needs to know that they can trust their intuition in making important decisions about their voice-over career. Your intuition will tell you whether a class is a scam or a life-changing opportunity. Your intuition will urge you to make a particular phone call to a certain client. Your intuition will guide you to make choices and take action toward building your career that you may not totally understand at the time but will make brilliant sense in retrospect. I realized I didn’t show you the picture of the statue at Versailles or tell you what I did with it. Every artist needs a star on her door, and I’m no exception. As I walk in my WhisperRoom each day, I see that splendid statue from Versailles, a lovely marble lady who looks like she was once holding a microphone in her hand. 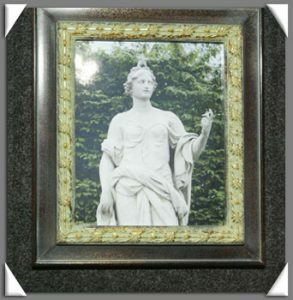 I even found a frame that matches the decorating scheme perfectly! By the way, I still haven’t made it to Austria. I know that there’s a reason for the delay. My intuition tells me that, like my studio decoration, that trip will be better than I dreamed possible when it finally happens. How has your intuition helped you in advancing your career? You read my story; I would love to read yours!